To work together, collaborate and promote better knowledge of the Mediterranean and its workers, it is important to know yourself well. In each newsletter, OCEMO gives a profile of one or two of its partners. 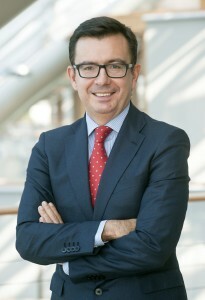 Roman Escolano, Vice-President of the European Investment Bank, explains to us the key part that this institution plays to enhance Mediterranean cooperation. – What is the role of the European Investment Bank (EIB) in the Mediterranean? Outside the European Union, the EIB implements the refundable part of aid agreements and cooperation that the Union has with 130 pays around the world. The EIB is also present in all of the neighbouring countries in the Mediterranean basin, other than the member countries: the 10 countries from Northern Africa and the Middle East and Israel (countries partnered with the Union), Turkey (applying for membership) and the western Balkans (countries hoping to join the Union). Our presence in the ten Mediterranean partner countries goes back to the beginning of the 1970s and has got progressively stronger as the cooperation agreements with the EU have advanced. Since 1996, the EIB has invested €20 billion and our current gauge is close to €1.5 billion per year. That shows the consistency of our investment despite all the difficulties that have descended upon the region for 20 years. For 2014-2020, the Union has assigned us a m andate of over €10 billion and, in addition to what President Juncker announced during his message about the state of the Union on the 14th of September, the European instances are currently discussing setting up an “Investment Plan for the Exterior” born from the success of the “Investment Plan for Europe”. The plan for the exterior will benefit countries from the Southern and Eastern shores of the Mediterranean and the African continent. This continued and specific financial support for the Mediterranean is a considerable asset that the European Union is bringing to this region. – What are your operational priorities? We support and help the partner countries’ economic and social changes to make them more capable of improving the quality of life and work of their inhabitants, and to successfully manage their integration into worldwide competition. Improving entrepreneurs’ access to loans to enhance job creation and improve the quality of local production. To do this, we work closely with the local banking and financial sector to provide companies mid- to long-term loans, equity, microfinance and guarantees. Funding infrastructure adjustment to economic and social development, especially in the sectors of sustainable urban development, energy efficiency (particularly public transport), education and professional training institutions, as well as developing effective health services. Finally, promoting company partnerships and direct foreign investments, not only for capital input, but also for the transfer of technology and the mobilisation of private local initiatives that these operations represent for the Southern economies. With this mindset, we are implementing financing techniques and the most modern guarantees which have been seen as effective with the rise of the automobile industry in Morocco, the medical industry in Tunisia and Egypt, and successful public-private partnerships in Jordan in water and renewable energy management. All of this is done with the support of local market authorities and operators: for example, we envisage developing funding in local currency in Morocco like this. – What are you iconic actions? Those would be projects in favour of sustainable development and climate transition. Last year, 50% of our funding was dedicated to this objective because global warming is already being felt in a real way in the Mediterranean. As a prelude to the COP22, the EBI held an international conference in Casablanca last year on the 8th of September. A few examples: the sea water desalination plant in Gaza which will now (finally!) supply drinking water to 150 000 locals, and is 60% powered by renewable energy. The Cairo underground attempts to relieve the Egyptian capital of its chaotic traffic. There have also been other major projects undertaken in Morocco: the new city of Zeneta near Casablanca will enable the relocation of 150 000 people currently living in slums; the wind farm around Tanger contributes to responding to the dem and of a fast-growing region; the solar complex of Ouarzazate, which has a potential output of 500 MW, the equivalent of powering a city with 1.5 million inhabitants; the Casablanca tram etc., the list goes on and on! – How do you see yourselves evolving the frame of your work in the coming years? Recent events (the democratic Arabic uprisings, the Syrian and Sahelian crises, the flow of refugees) have left us thinking that getting additional resources ready will be a sine qua non condition to support the development and economic resilience in the long term, as well as for creating sustainable employment. In the next five years, the total volume of loans should reach over €15 billion for the Southern and Eastern shores of the Mediterranean, including Turkey. This is significant, but is probably not sufficient if you take into account the considerable issues that the region has. This is why we are very actively participating in discussions about the amount, objectives and nature of the financial products which make up the “Investment Plan for the Exterior”. It is important for this plan to have a significant dimension. At this stage, the most important orders we’re planning are focussed on the €30 billion of additional funding over the next five years.